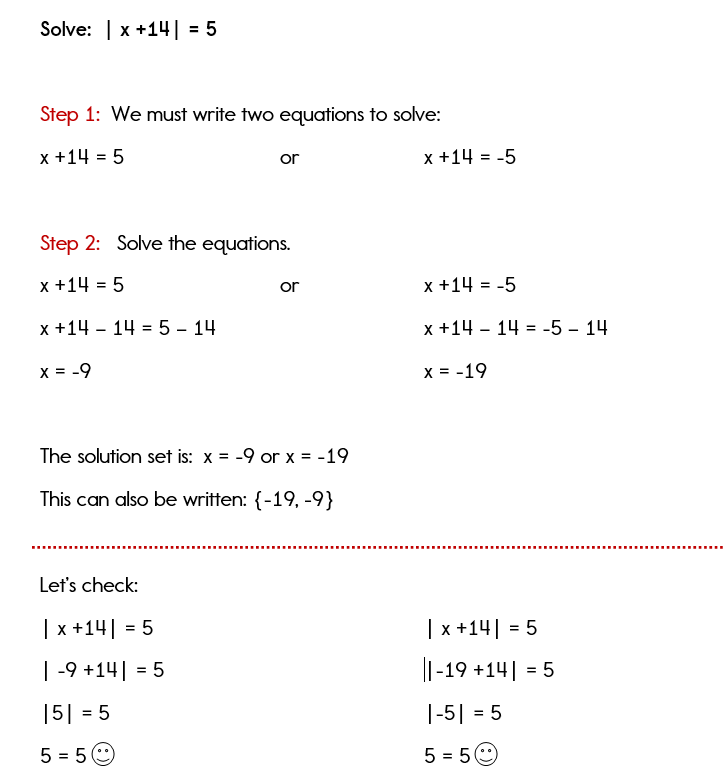 You've come pretty far in your algebra studies, and now as you start learning more advanced algebra topics, you may see equations with absolute value expressions. Let's first quickly review what the term "absolute value" means. The absolute value of a number is its distance from 0 on the number line. Remember: Distance can never be negative; therefore, the absolute value of a number is always positive. | -5| = 5 (-5 is five units away from 0 on the number line). |5| = 5 (5 is also five units away from 0 on the number line). Did you notice how in the above examples, the answers of 10 and 55 were the same for two different expressions? By this I mean that |-10| = 10 and |10| = 10. There were two different expressions to get the answer of 10. |x| = 4 This means: What value can we substitute for x to get an answer of 4? Isn't |-4| = 4 ? So, this answer is x = 4 or -4. This concept will play an important role as we solve absolute value equations. Pay careful attention because many of your equations with have two answers. You must remember that when you are solving an absolute value equation, you will want to write two separate equations to solve. This is because the value inside of the absolute value bars can be positive or negative to result in the same answer. Let's take a look at another similar example just to clarify any problems or questions. I hope that you are feeling more comfortable with absolute value equations. There is a time when you may not have a solution. Yes, there always has to be tricks, just to keep you on your toes. What would you substitute for x in the following equations to make the equation true? Can you think of an answer for x? Probably not, because there is no answer. There is no way that you can take the absolute value of a number and have a negative answer. You can stop right there and write the empty set as your answer. You do not have to write two equations and solve, because there are no real answers to this equation. 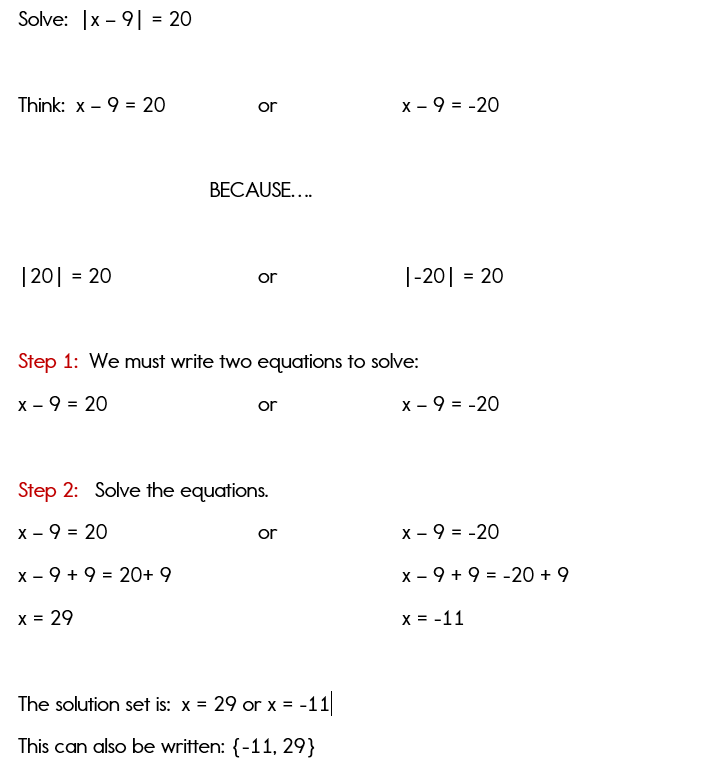 For most absolute value equations, you will write two different equations to solve. The value inside of the absolute value can be positive or negative. If the answer to an absolute value equation is negative, then the answer is the empty set. No absolute value can be a negative number.